With sunny skies and warmer-than-normal air temperatures forecasted for the weekend, the Coast Guard is issuing a cold-water warning to late-season boaters, paddlers, hunters, and fishers. Water temperatures are rapidly declining, greatly increasing the dangers of sudden, cold-water immersion. "We recently had two commercial fishermen survive the sinking of their boat in Cape Cod Bay," said Al Johnson, the recreational boating specialist for the First Coast Guard District in Boston. "Fortunately, as their boat sank in high winds and heavy seas, they were able to don their survival suits. They spent almost five hours in 52-degree water before being rescued. Their survival suits saved their lives." 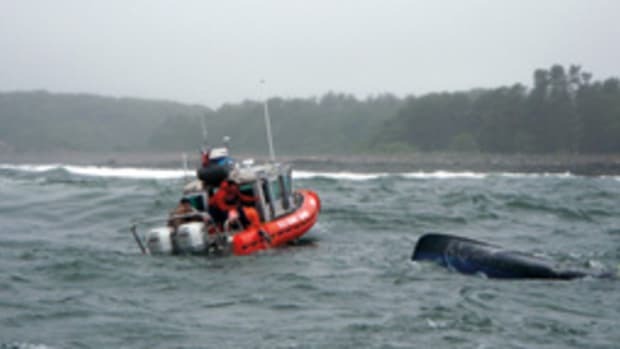 The Coast Guard stresses that it is essential for anyone engaged in water activities this time of year to be cognizant of the risk of falling overboard or capsizing and the importance of being properly prepared for survival if the need occurs. "The best protection would be a full dry suit with life jacket," recommended Johnson, "This would be followed by a wet suit under protective clothing with a life jacket and, finally and at the minimum, protective clothing and a life jacket." Additionally, Johnson recommends boaters carry a hand-held VHF radio, a cell phone in a water-tight bag, a head lamp, a strobe light, a wool hat, neoprene gloves, signal flares and a signal mirror. "The waters of the Northeast are cold and getting colder," said Johnson, "For the average person, the debilitating shock of sudden immersion can be fatal. The important thing is simply to be prepared and to be properly attired for survival." * Assess the risks: envision what can go wrong and be fully equipped and prepared. * Planning, preparation and a positive attitude are essential. * Leave a float plan with a responsible individual who knows your intentions, location, and who to call if you fail to return as scheduled. * Carry a VHF radio and other means to communicate. * Be aware of and prepared for the shock of sudden immersion and incapacitating effects of cold water - dress to get wet. * Maintain situational awareness on the water - be aware of activity around your vessel, weather changes and always know your location. * Boat safe and sober. Save the alcohol for when you&apos;ve safely returned. Johnson also recommends this Web site for sudden immersion and cold-water awareness information.